Banded hairstreak on milkweed seen on the Island Ford count July 5. Imagine you are a butterfly. You love the hottest days with the most humidity so your wings can be warmed as you spend your days looking to mate before you forever fly away. Butterfly Counters have to contend with those hot humid days to see the most butterflies. And as cool morning air changes to sunny hot, the number of butterflies you will see suddenly increases. The North American Butterfly Association sponsors an annual July 4 Butterfly Count. Locally, it has been administered by Mike Smith of Elkton. He compiles all the group totals and reports the results to the Association. Mike is a member of the Rockingham Bird Club and he and other Bird Club members make up the core of volunteers who participate. Also this year, three members of the Headwaters Master Naturalists, Chris Bowlen, Betty Forrest and Jerry Hopkins, joined the Counters on July 5 to enjoy the heat and humidity for the 15th annual Rockingham County – Island Ford area Butterfly Count. Then on July 13, a Shenandoah National Park Butterfly Count was done with Betty Gatewood joining Betty Forrest and Jerry Hopkins to represent Headwaters. The July 4 Butterfly Count is similar to the annual, and perhaps better known, Christmas Bird Count. While the actual counting of species may not be exactly July 4 or on Christmas Day, it is as close to the date as weekends, weather or schedules allow. The Island Ford count on July 5 started at 8:30 am on a cool day with the temperature below 70 degrees, which is the ideal minimum temperature that butterflies become most active. As the butterflies were not as active at this temperature, this part of the count is where you walk into the fields and use the “kick-up” method of getting those butterflies that may be on grasses or flowers to start to fly. You aren’t actually kicking any butterfly, you are just walking through the field, and your activity of moving the vegetation causes them to fly. The day had 100% sun with a low temperature of 63 and a high of 83. So, what are the results? The Island Ford Count had 36 different species of butterflies and 727 individual butterflies. The Shenandoah National Park Count encompasses an area with a 15 mile radius. There were many groups participating in such a large area and not all groups have finalized and reported their count. But this day was a ‘butterfly day.’ It was so hot and humid that it took two hands to push open your car door to cut through the humidity. Final numbers should be good. Do you really need extensive experience in identifying butterflies to participate in the count? No experience needed! Mike pairs you with an experienced group and you quickly get to know those smaller butterflies that favor the grasses and the larger ones that are seeking the nectar of bigger and taller plants. If you are new, you become amazed at how quickly you begin to see butterflies that before you probably never ever noticed. Participants in the Christmas Bird Count experience this same type of learning curve. 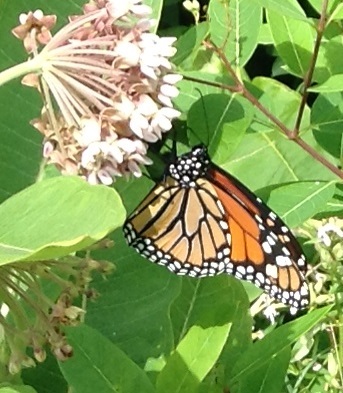 For the first year, there were no monarch butterflies spotted on the Island Ford count. Mike has participated in the count for 15 years and will say that the numbers of individual butterflies are down considerably from years past. Why? Habitat loss, liberal use of pesticides, insecticides and herbicides all play a part in the lower numbers. For the first year, there were no Monarch butterflies spotted on the Island Ford Count. Would you like to learn more about butterflies and participate in next year’s count? Just mark your calendar for July 4 and view the Master Naturalists’ Calendar of Events. You will really enjoy it and learn more of nature. July 31, 2014 in Projects.